Listen to DRM Digital Radio Broadcasts. Some tests with the USB Dongle RTL2832. 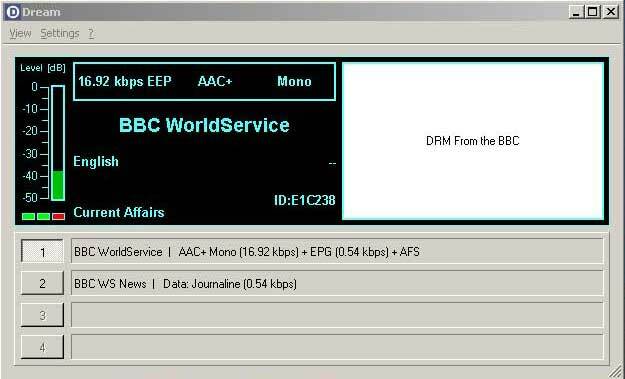 Listen to DRM Digital Radio Broadcasts on MW and SW. Some tips and hints how to use the RTL2832 USB dongle. The USB Dongle RTL2832 including its plastic housing is 85 mm long, 27 mm wide and about 14 mm high. I bought it in Internet from Superbat Electronics in April 2014 for USD 11.- including shipping from Hong Kong. Also included in the price was a remote control with a battery and a software for watching TV (which I have not used). There was a small antenna with a connector included in the shipment. The first one I bought cost slightly more, had no antenna but instead I got an adapter that fits TV or cable TV connectors. I had heard somewhere that it should be possible to use this receiver for short wave without an up-mixer and decided to give it a try. I took my RTL USB dongle apart and located the pins 1 and 2 on the RTL2832U. In my version those two pins were fitted with coupling capacitors marked C33 and C34. Connecting an antenna to pin 1 did not produce any results at all. Then I removed C34 and connected my active antenna via a 0.022 uF capacitor in series. With the SDRSharp v1.0.0.163 (which is available free on the Web) set to Direct sampling (I branch) I could listen to KBC Radio on 6095 kHz in AM with quite good results around noon in August in Sweden. At least some sound. 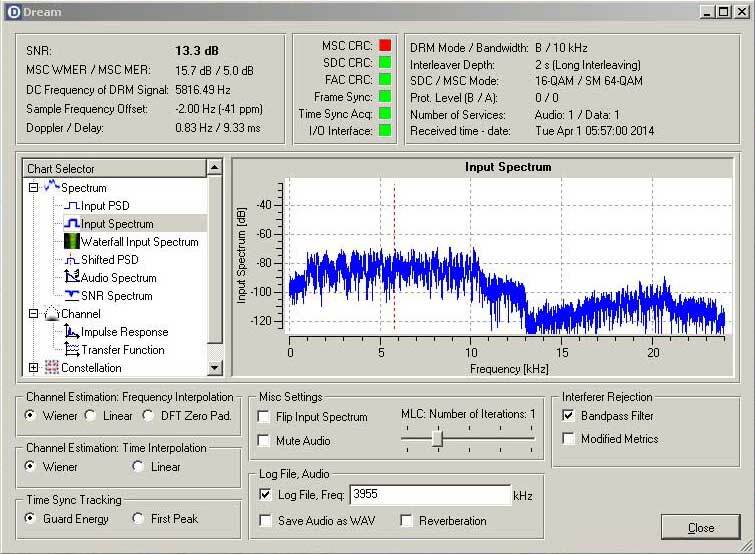 In order to use the RTL2832U dongle with the SDR Sharp it is necessary to install the Zadig software. It will uninstall the drivers installed by the CD that came with the RTL2832U and install the necessary drivers to connect to the SDR Sharp. Then, to use the Dream software with the SDR Sharp it is also necessary to install an additional driver, a "Virtual Audio Cable". I use the "VB-CABLE" which turned out to work well. With the RTL2832 Dongle in its USB port and the SDR Sharp and Dream running on the computer it is time to set up the parameters for DRM reception. 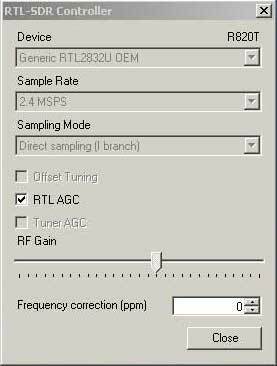 Check the box "RTL AGC"
In the SDR# main window check the box "Use AGC"
Tune the SDR Sharp to a DRM transmitter. In Fig. 4 the receiver is set to BBC on 3955 kHz. 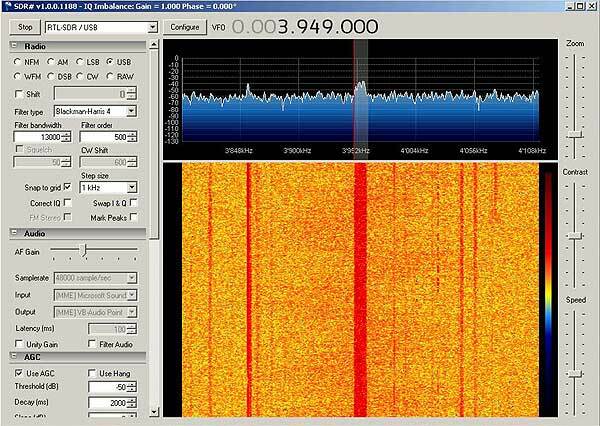 The tuned frequency should be set to 6 kHz below the wanted frequency, in this case 3949 kHz. Use DReaM 1.7.9 or higher. Usually I'm using the V1.6.1.cvs with most my receivers, but I noticed that V1.7.9, V1.14 and V2.1.1 work well in my configuration. For some reason the V1.6.1.cvs did not decode any audio. A drawback with the V2.1.1 is that you can not set the frequency manually for the logs. In case the Stations list is out of date you need to edit the .txt and .csv files manually. 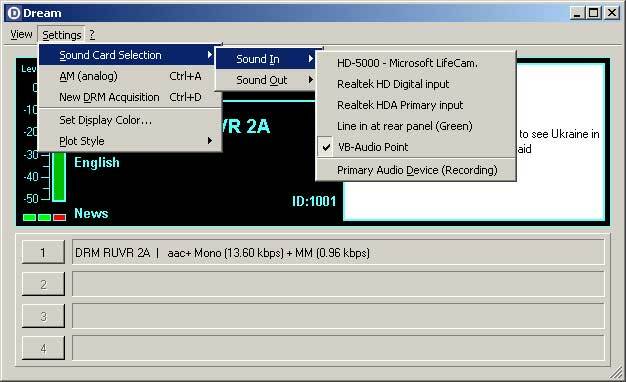 Under "Settings" in Dream, select "Sound Card Selection - Sound In - VB Audio Point". The output should be set to the normal audio to get the decoded audio to the PC loudspeakers. There are no special settings to change in the Dream Evaluation window. Use the volume control in the SDR Sharp to adjust the input audio to Dream if it is too little or to loud. At least DRM reception is possible with this basic attempt using a simple antenna and the RTL 2832U Dongle. More to follow later: An improved antenna connection to the RTL Dongle and some added pre-selection for the different frequency bands.